One of the most obscure drinks I’ve blundered across is the Zazarac. That may seem like a misspelling of the Sazerac, that otherworldly classic that comes to us via mid-19th century New Orleans. And some will argue that the Zazarac was the same drink, spelled differently as a litigation dodge. But there are better reasons to believe that the Zazarac, as captured in certain editions of Harry Craddock’s definitive-for-its-time The Savoy Cocktail Book (1930), is its own thing. And what a peculiar thing it is. Ted Haigh’s Vintage Spirits & Forgotten Cocktails, the definitive scholarly exhumation of defunct cocktails, mentions two versions of the Zazarac, which he found typed in a 1930s bartender’s pocket notebook. I’ve lined them up below, adding what I’m calling #3, which appears in Harry Craddock’s book. As you can see, the household comprises one perfect child and three black sheep. The Sazerac and Zazaracs #s 2 and 3 all abide by the classic definition of a “cocktail”: Base spirit, sugar, and bitters. All share absinthe. But from there things get hairy. Z1 omits bitters, flouting the “cocktail” definition. It adds sweet vermouth and Amer Picon [a dark, bittersweet, fragrant French apertif, a bit like Italy’s Averna]. It tosses in curacao, an orange liqueur similar to Cointreau or triple sec. So it goes in pretty deep with orange. Z2 uses Peychaud’s, sure enough, but then tosses in orange bitters and Amer Picon — again, an unusual commitment to orange. Z3, explored below, adds white rum as a second base spirit [! ], and anisette, a sweet licorice-flavored liqueur whose anis-y power essentially doubles down on the absinthe. It retains a hint of orange only via the bitters. It seems unlikely to me that any of the Zazaracs were attempts to produce the Sazerac and avoid legal trouble with the New Orleans Sazerac House importer, the French maker of Sazerac cognac, or any number of taverns nationwide with the same name. At best they are heavy-handed riffs, at worst original desecrations. 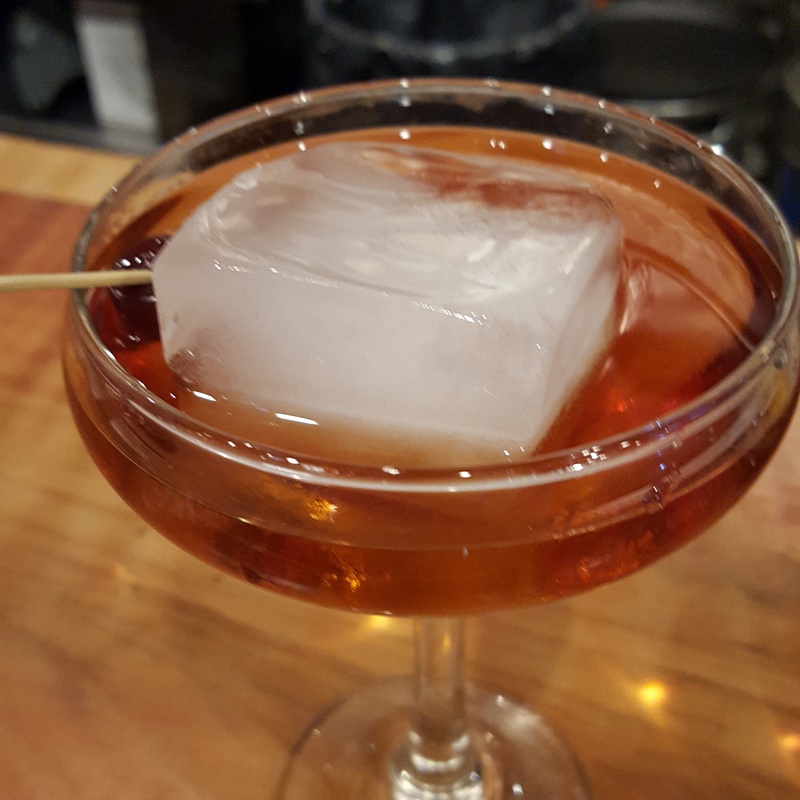 And since all versions add to rather than replace ingredients of the Sazerac [excepting the swap of bitters in #3], it seems unlikely that early American supply chain issues drove these variations. Nope. These Zazaracs are not legal dances to stay out of court. For better or worse, but mainly worse, they are purposeful creations unto themselves. The Sazerac and the Zazarac have as much in common as a lucid dream and your kitchen junk drawer. The Zazarac cocktail: It’ll put a [mis-]spell[ing] on you. The Zazarac recipe presented here is a modified version of what appears in Wikipedia. I know that’s lame, but bear with me. There’s a lot of confusion here, and the Wikipedia one appears to hunker pretty closely to one in the Savoy book, which became the reference recipe going forward. Anyhow: Let’s grab a pair of tins and shake things up. Actually we should stir them up, but that’s another twist in this odd little tale. Or Canadian whiskey — Canadian Club if you want to get specific. Canadian whiskeys skew more rye-heavy, so this alternative makes sense. I used Bacardi white, which aligns with several recipes I dug up. I used pastis, a French version of that family of licorice-flavored beverages. To be more historically and culinarily accurate — and I know how deeply important that is to you — you should use Sambuca or Ouzo. It’s a maceration vs. distillation thing, and an anis vs. licorice thing, for what it’s worth. “Rich” simple syrup mixes sugar to water 2:1. The original called for gum arabic, aka gomme syrup, an even sweeter elixir. Yeah, I know. Absinthe + anisette. Anisette — pastis in particular — is often used in place of absinthe. Why use both in the same drink? Who knows? Worse: Many Craddock follow-ons call for .5 oz absinthe. Shake, strain into an Old Fashioned glass, garnish with lemon peel. The recipes all say to shake, though there’s no citrus in sight. Maybe that’s a relic of the days when gummy gomme was used, which may have needed more agitation. Beats me. A classic that’s leave-it-on-the-kitchen-counter-when-the-host-isn’t-looking bad. Three people walk into an elevator at the Algonquin hotel. One of them farts. I’m generally no bellyacher. But in my blunderings through cocktail literature I just surfaced a real stinker, and feel compelled to sound an amicus alarm. The decoction I refer to is the Algonquin cocktail, which shows up on diligent lists of American Classics — A sip of history! A brush with greatness! Etc. Etc. Etc. Author Craig StoltzPosted on March 21, 2016 April 13, 2016 Categories Classics, Spirits, StinkersTags Cocktail history, RyeLeave a comment on The Algonquin: No Sirree!